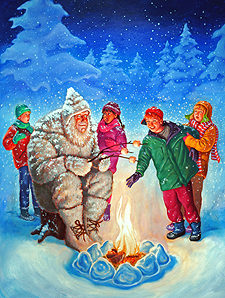 From "The Abominable Snowman Doesn't Roast Marshmallows"
From "Bub, Snow, and the Burly Bear Scare"
I graduated from Pratt Institute in Brooklyn in 1984 and have been working as an illustrator and/or caricaturist fairly consistently ever since. 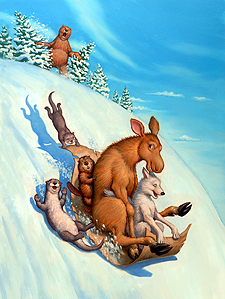 When my family and I moved to Brattleboro from Brooklyn in 1997, I was busy juggling illustrations for three series of books, The Bailey School Kids, The Bailey City Monsters and The A to Z Mysteries. For the illustrations on the covers of these books I used the Norman Rockwell approach: I would have models pose for photographs based on my concept sketches, then I would complete the oil paintings using the photographs as reference. In New York City, getting subjects to pose was easy -- agencies have catalogues full of aspiring child and adult models. But when I moved here, I realized it would be extremely creepy to approach kids in the playground and ask if they want to be on a book cover. (I mastered the art of approaching the parents, not the kids.) Within a few years, my own children were old enough that I could use them and their friends. I think, the last time I counted, I've used about forty adults and kids from Brattleboro to pose as models for my work. Illustrating the various series of books was good steady work, but, like TV series, chapter book series don't go on forever, and inevitably these book series ended. 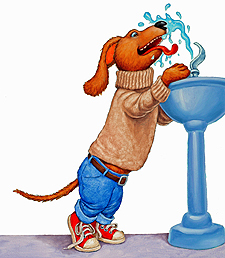 This was just as well, because my favorite thing to illustrate is not people but animals -- specifically, funny, anthropomorphic animals. And my long-term goal was to write and illustrate my own stories. So when the chapter books stopped coming, I joined a writers group led by Jesse Haas and Mike Daley. It was as part of that group that I wrote Dinosaur Train (HarperCollins, 2002). 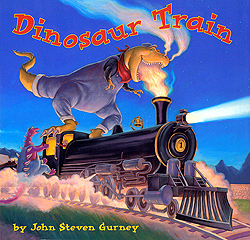 The story was inspired by my son Jesse, who, as a toddler, was fascinated by trains and dinosaurs. In the story, Jesse combines these two obsessions, and the result is an adventure on an oversized train full of dinosaurs. I was fortunate enough that the third publisher I sent it to accepted it. Since then I have submitted a dozen other stories to a dozen publishers, as of yet with no luck. Hopefully, someday soon, there will be a growing number of published books that I've written and illustrated.